Now here's a conundrum. First we find this distinctive plaque dedicated to a John Nichols of the 2nd Battalion, the Devonshire Regiment. Sadly, there is consistent evidence that this man's family spelt their surname NICKOLS. The CGWC gives his details as being from the 2nd Battalion, and his death date as 18 December 1914; it also connects him with parents called Nickols living in East Ogwell. However, the hand-written memorial (see below) also names a John Nichols as having died in the Great War. There is a John Nicholls in Army records who served in the 5th Battalion and died in August 1918. but his connection with East Ogwell is not known, so there is an element of mystery in this transcription. 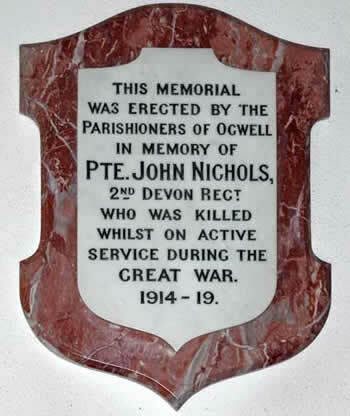 9401 Private John Nickols of "A" Company 2nd Battalion, the Devonshire Regiment. Son of George and Florence Nickols of "The Jolly Sailor", East Ogwell. Born in Moretonhampstead in 1894. Died 18 December 1914 aged 20. 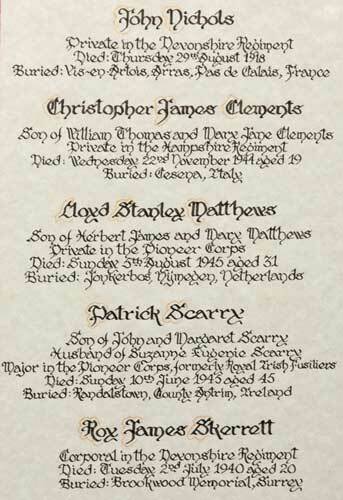 This hand-written memorial includes four men who died in World War 2 and adds a reference to a John Nichols from World War 1. Interestingly, this memorial gives a different date for his death and names a burial place and may refer to John Nicholls whose family farmed in the adjoining parish of Ilsington. Private in the Devonshire Regiment. Died Thursday 29th August 1918. Buried Vis-en-Artois, Arras, Pas de Calais, France. Son of William Thomas and Mary Jane Clements. Private in the Hampshire Regiment. 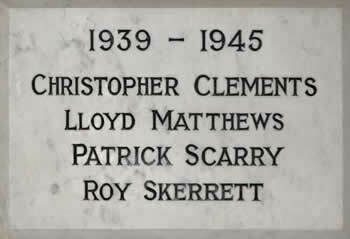 Died Wednesday 22nd November 1944 aged 19. Buried in Cesena, Italy. 14590254 Private Clements was the con of William Thomas and Mary Jane Clements (née Weeks). He was born in the Totnes area in the March Quarter of 1925. Son of Herbert James and Mary Matthews. Private in the Pioneer Corps. Died Sunday 5th August 1945 aged 31. Buried in the Jonkerbos War Cemetery, Nymgen, Netherlands. 13036564 Private Matthews was the son of Herbert James and Mary Matthew (née Smith) of East Ogwell. He was born in East Ogwell in the December Quarter of 1916. Son of John and Margaret Scarry; husband of Suzanne Eugenie Scarry. Major in the Pioneer Corps, formerly Royal Irish Fusiliers. Died Sunday 10th June 1945 aged 45. Buried Randalstown, County Antrim, Ireland. 255646 Major Scarry rose through the ranks in the Royal Irish Fusiliers. He was the son of John and Margaret Scarry (née Morony) and was born in Ireland. He married Suzanne Eugenie Scarry who lived in East Ogwell. Corporal in the Devonshire Regiment. Died Tuesday 2 July 1940 aged 20. Buried Brookwood Memorial, Surrey.